Many of us are attracted to the idea of marriage and yet feel a bit uncomfortable with some of the rituals that are traditionally associated with the big day. Perhaps the old ceremonies place too much emphasis on theology or else seem out of step with some of the complex realities of contemporary relationships. In response to this dilemma, the School of Life has rethought exactly what the ideal wedding day would consist of and redesigned the entire process from scratch for the use ofmodern couples. The book begins by proposing new ways of getting prepared for a wedding at a psychological level, suggesting how couples should ready themselves for the often tricky journey ahead and how to think through some of the thorniest issues that beset love. The book then presents an entirely practical and thoughtfully redesigned wedding ceremony, from picking out a suitable venue to suggested vows and readings. 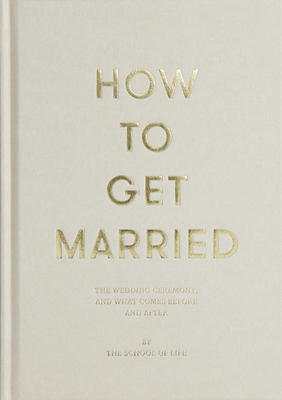 Finally, the book offers some ideas for how to approach the start of married life. What follows is a bold rethinking of one of humankinds most important and popular rituals.